Rembrandt Harmensz van Rijn, the son of a miller of the city of Leiden / Leyden, was born on July 15th, 1606. That he first saw light in his father's mill is a story for which there is as little foundation as that he first studied art amongst his father's flour-sacks. His first instructors were Jacob van Swanenburgh, who had studied in Italy and was married to a Neapolitan, and Pieter Lastman, to whose style his first works (ca. 1627) exhibit an extraordinary resemblance. In 1631 Rembrandt removed to Amsterdam, which had gradually out­stripped the other towns of the Dutch Republic and had become virtually its capital, ascendant not only in the domain of politics, but prescribing also the direction to be given to the study of art. A new and stately architecture testifies to the splendour of the town at that period. Vondel and Hooft represent the muse of Poetry, while numerous engravers and painters, of whom several connected themselves later with Rembrandt, such as S. Koninck and Jan Lievens, found employment in Amsterdam. Rembrandt very soon made himself famous as an artist; fortune smiled upon him, too, in his love affairs. From the year 1633 the face of a good-tempered, handsome woman appears from time to time in his pictures. This is Saskia van Ulenburgh, the daughter of a Friesland lawyer, whom he brought home as his bride in 1634. The numerous portraits of Saskia, painted by the great artist with evident gusto, have familiarized us with her countenance; the best are shown in museums. After Saskia's death (1642) Rembrandt's private affairs took a turn for the worse. He had furnished his spacious house in the Joden-Breestraat (at that time the street was known as the Sint Anthonisbreestraat) with reflued taste in the style of a nobleman's mansion. The walls of his apartments were covered not only with works from his own and his pupils' hands, but such Italian masters as Palma, Giorgione, etc., were likewise represented. He possessed also numerous antique busts, vases, weapons, and costumes, as well as a choice collection of engravings, drawings, and etchings. The great finanaial collapse; which since 1653 had continued in Amsterdam, bringing wide-spread and ruinous disaster upon the community, did not suffer our painter to escape. He was declared bankrupt in 1656, and an inventory of his effects was taken by the commissioners of the "desolate-boedel­kamer". The sale of his antiquities and paintings, which today would represent a value of millions, realized in 1657 only 5000 florins. The house itself and the collection of engravings were brought to the hammer in the following year. Rembrandt thenceforward resided in a modest dwelling in the Rozengracht (Canal of the Roses) along with his son Titus (died in 1668), comforted by the faithful affection and ministrations of his servant Hendrikje Jaghers or Stoffels (died ca. 1663). The close of his life found him poor and living in complete retirement; still busy notwithstanding, and still capable of laughter, as a portrait of himself from his own hand (painted about 1668) gives evidence. He was buried on 8th October, 1669. 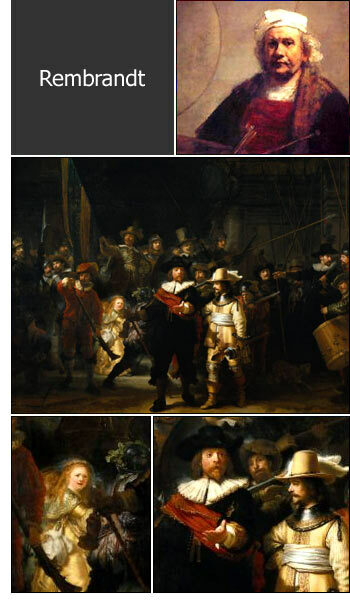 Read more on Rembrandt, his paintings and life.